Tis the weather for steamboats (or hotpots) and so I headed out, and embraced it whenever I could. This evening’s explorations led me to this little restaurant aka high-end coffeeshop with ac and all that serves the traditional fishhead steamboat. 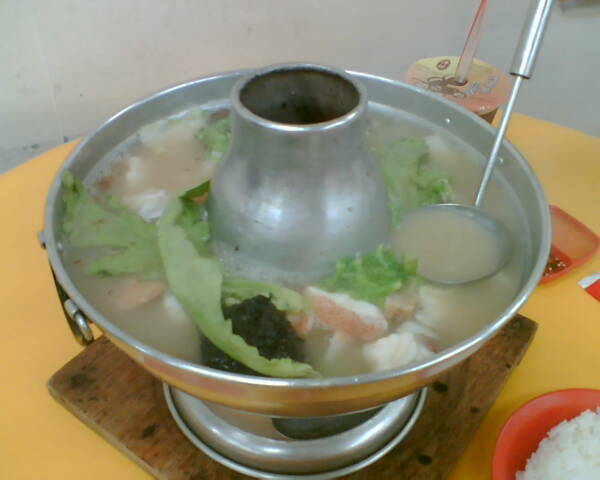 Essentially, its parts of the fish (not necessarily the head), served in a steaming charcoal fuelled steamboat, filled with a rich and creamy (looks not taste) fish broth and a variety of vegetables – tang oh, cabbage, seaweed and even yam (taro). It was delicious. I felt that it could do with a tad more smokiness though, the kind that you would normally find in the most traditional of charcoal steamboat places – the one on Moonstone Lane being one such place (which reminds me, I have not made my way there in ages). Oh, and the place also serves a very potent chilli dip. I would go easy on this if I were you. Prices are gentle on the pocket. Our bill for a steamboat for two came up to S$25 (US$14.70).